KoopaTV: What's Your Style? Retro vs. Modern Splatfest! By LUDWIG VON KOOPA - Featuring Nintendo Switch Online. I'm not really one for wearing clothes. You know, normally. Sometimes, special costumes and outfits are cool (there was a whole Splatfest about that). But normally, Koopas wearing hoodies just look terrible. I'm all about the RETRO style! I'm all about the MODERN style! 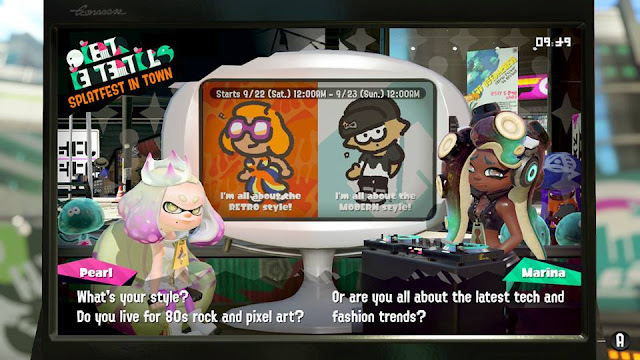 This Splatfest is wondering what your “aesthetic” is, which is some kind of tumblr concept that I don't understand or appreciate. I just know it's annoying. On KoopaTV, I not only bash retro gaming by saying that no one cares about NES games, but I regularly bash modern games and their practices. Obviously, I'm just an all-around hater, so I'm not sure what my “style” is. Well, steampunk is Team Retro and cyberpunk is Team Modern? Well, that makes my choice easy. Obviously Team Retro. Steampunk is awesome. “ So everything is steam-powered. Usually, my choices are on at least slightly sturdier logic than just looking at the official Splatfest artwork, so I'll justify Team Retro over Team Modern on grounds besides steampunk being superior to cyberpunk. What could be more sturdy than a Koopa shell? Nothing. While a Koopa's shell isn't an actual article of clothing (as opposed to a part of the body), it would classify as... style. Left: My green shell as of Mario & Luigi: Superstar Saga (2003). Right: My blue shell as of Mario & Luigi: Superstar Saga + Bowser's Minions (2017). Before New Super Mario Bros. Wii (2009), my shell was green (despite what some bad retro in-game sprites might show you, along with inaccurate hair colour), like many of the other Koopalings... and more importantly, like King Bowser Koopa's shell. Then New Super Mario Bros. Wii happened and my shell turned to blue, along with the shells of the other Koopalings. It was all done as a conspiracy to portray me as anything but King Bowser's eldest son! All in an effort to recast me as a nobody, and that pest Bowser Jr. (who I have some choice words I'm reserving for an article coming in the very near future) as the heir to the Koopa Kingdom throne! ...Oh, right. I nearly forgot. This is the first Splatfest that will be using Splatoon 2's version 4 rules, with the Normal and Pro versions of Splatfest matches. It's also the first Splatfest that will be taking place under Nintendo Switch Online's paid service (another reason to long for the retro days before Nintendo started charging for online without providing value in return). I myself will be using the 7-day free trial to be able to play this Splatfest. Ludwig doesn't know about the styles of your world, so if you have your own reason for choosing retro over modern or modern over retro, go ahead and share them in the comments section below. He can only speak for himself, where he believes things were better in years past than at present. The Splatfest before this had utensils duke it out. When it came to a sort of similar theme, Past vs. Future, Ludwig sided with Team Past. As promised, here's Ludwig trashing Bowser Jr. one day later. Not even one full month later is the next Splatfest: Trick vs. Treat! Want to learn more about the new Splatfest rule system that Retro vs. Modern debuted, and the results? Click here. I'm siding with Team Modern this round because I'm all about the present. While I do admit the steampunk design for Pearl is superior to Marina's cyberpunk design, I'm basing my choice on the two as a whole. I would much prefer to wear the style of today than I would 70s or 80s fashion. I don't even know what 70s or 80s fashion is to you humans.